In short: The ultimate luxury off-road vehicle. Designed with off-road expeditions in mind, this rugged, mid-sized SUV features a full-time four-wheel drive, a robust 4.7-liter V8 engine, and traction controls for tackling uneven terrain. 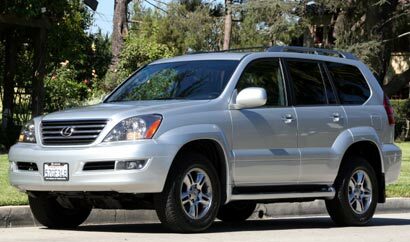 Yet, in spite of its ruggedness, this eight-passenger tank is able to keep its riders comfortable with a well-appointed and quiet interior, which includes genuine leather furnishings, a power moonroof, and multi-adjustable and heatable front seats. Our tester also included some of the model’s optional features, such as a voice-activated DVD navigation system with a rear view camera. Warranty/Service: Four-year/50,000-mile basic warranty; six-year/70,000-mile powertrain warranty; six-year/unlimited-mile corrosion perforation warranty; 24/7 roadside assistance.